Issue #13, from writer Nick Spencer and artist: David Acuna, is poised to be an episode that explores further the Civil War II event. 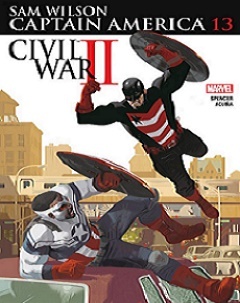 In recent issues, Sam Wilson has come up against the Americorps and the CEO’s controlling them. Last time out, Captain America acted as a mediator in a civil disturbance involving the police that was very close to escalating. The US Agent arrived, deployed into action by Americorp, under the belief that Sam Wilson is the main menace. John Walker, the US Agent, is a former Captain America himself, and is not pleased with how Sam Wilson has taken on the mantle. The entanglement with US Agent will be continuing next edition, also expect further run-ins between Captain America and Americorp. In the Civil War storyline, Captain America thus far is divided on the issue, both Captain Marvel and Iron Man attempted to lure Cap into their contingent. This inner turmoil will re-emerge in the next edition. Captain America Sam Wilson #13 will be available from September, 28th.